One of the keys to success in most things is being in the right place at the right time, and being prepared to take advantage of the opportunity. The world is filled with individuals who are waiting for their ship to come in but they are always getting to the dock on the wrong day or at the wrong time. ‘You should have been here yesterday, last week, a couple of hours ago, are comments that are heard all too often in the world of fly-fishing. The water is too high or too low, it's too early for that hatch, or you're too late it happened last week, are just a few of the words that no angler wants to hear after driving all night or just at the start of a short vacation. To help avoid some of these disappointments I would offer a few things I have learned from over a half century of chasing fishing opportunities. Some people operate on the theory that if you throw your lure into the water often enough eventually you will get lucky. Even though I am now retired my time is too valuable to adopt that approach. If you have tried to plan your fishing trips based on the ‘cross your fingers and hope theory' may I offer the following approach that will help reduce the number of trips where the only thing you accomplished was getting out of the house. It has been said that nothing succeeds like success, and nothing insures success more than knowledge. My formula is – knowledge +experience = opportunity. Part of the joy of any activity is gaining the essential knowledge about that activity so you can enjoy it to its fullest extent. Essential to fully enjoying the sport of fly-fishing is to know when the appropriate time is to be at a certain location, or when to be on a certain piece of water. For example, you don't come to Montana in May or June and expect to find the streams running at summer levels. It's not rocket science but every year eager anglers show up expecting to find the Yellowstone or the Madison running cool and clear in early June, and they are shocked to discover them bank full of cold dirty water. More demanding is the knowledge of the idiosyncrasies of a particular stream or a given hatch. This is where it gets to be fun, and it's what separates the average angler from the proficient angler. 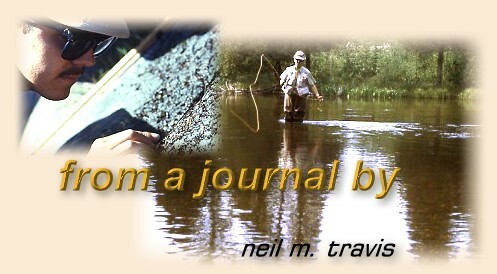 A few years ago I was planning on fishing one of my favorite streams during a specific hatch early in the season. The weather had been favorable and all the reports were positive. Unfortunately just before I arrived the weather took a change for the worse, and a day of heavy rain turned this normally clear stream a light chocolate color and raised the level by nearly a foot. Most of the anglers who were planning on fishing there changed their plans and went elsewhere, but I was there to fish. I had come expecting to fish dry flies, but the conditions ruled out any dry fly fishing for several days. This is a tail water fishery and once before I remembered that when they had suddenly raised the water level overnight that they had flushed lots of worms into the river and the trout went crazy feeding on those delicacies. While not exactly the type of fishing I had expected, a large San Juan worm bounced along the bottom produced a fish on almost every drift. For a couple days I had the water almost completely to myself and I enjoyed great fishing. Knowledge + experience equaled opportunity that all those other anglers failed to capitalize on because they did not know the idiosyncrasies of that particular water under those conditions. While many similar occasions come to mind after so many years of fishing another more common experience serves to illustrate the point. It was a perfect day in early July, and I was thigh deep in a beautiful trout stream. The water was gin clear, a few caddis and an occasional stone fly were bouncing around on the surface, and there was just enough activity to keep things interesting. This activity continued most of the day, but by late afternoon the sporadic caddis/stonefly activity faded away. There were several other anglers in the parking lot when I ambled back to my car to retrieve my thermos of coffee. One by one they stowed their gear and drove away leaving me alone. This was high summer in Montana, and I knew that barring some unforeseen condition that the best was yet to come. Just upstream from the parking lot was a long flat that pinched down into a short riffle near the tail of the pool. With my thermos of coffee, I walked upstream to a point where I could watch the length of the pool while reclining against a convenient cottonwood. As the shadows lengthened, a cow elk and calf came down to the stream to drink, and as the cool of the evening began to replace the heat of the day several doe mule deer with their fawns eased out of the coulees to feed on the lush meadow grass.